Nasa engineers looking to monitor charged particles hitting the Earth's atmosphere have come up with a simple, low-cost, 'swarm' of satellites that can talk to each other in orbit. The system is called the Edison Demonstration of Smallsat Networks, or EDSN, and will showcase the ability of swarms of tiny, cheap nanosatellites to do scientific, commercial and academic research tasks in space. 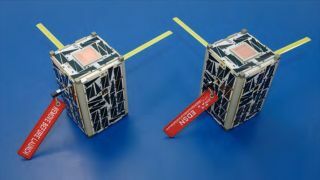 Like the PhoneSat spacecraft that launched in 2014, containing a cheap smartphone to perform computations, the individual EDSN satellites are the size of a tissue box and weigh just two kilograms. They have no propulsion, so will drift apart naturally in orbit. Each carries an instrument to count charged particle events in low orbit, and they also have the ability to talk to each other - sharing the data they collect and taking turns to beam it down to the ground. Only one needs to contact the surface on each pass to transfer the data from all eight satellites. "What we learn from EDSN will enable future Nasa missions. This will be the first demonstration of a 'swarm' of networked nanosatellites," said Roger Hunter, from Nasa's Ames Research Centre. "We can easily envision constellations of nanosatellites in the future focused on various scientific missions in earth sciences, heliophysics, planetary sciences, and astrophysics." The spacecraft will launch in the coming days on Nasa's new and wonderfully-named ORS-4 Super Strypi mission - the first satellite launch from the US Navy's Pacific Missile Range Facility on the Hawaiian island of Kauai.